Walk around the Navy Yard and Capital South neighborhoods and there’s one glaring thing you’ll be unlikely to miss - cranes. The skyline is littered with them. DC has seemingly been in a constant state of construction with new luxury condo and apartment buildings springing up all over the city. As it turns out, no place more so than this SE neighborhood, south of the Capitol Building and sandwiched in between the Potomac and Anacostia Rivers. According to RealPage Inc., a property management software producer, the area ranks as the fifth most active sub market for apartment development in the nation. For long-time DC residents, that fact may be surprising. In the 1950’s, the neighborhood became the nation’s first urban renewal area as housing complexes like Tiber Island and Capital Park introduced a mix of residential styles and have since been added to the National Register of Historic Places. But over time these redevelopment efforts didn’t change the gritty industrial nature of the area and it sat virtually untouched and unnoticed for decades. Even fifteen years ago few developers considered the neighborhood a viable investment. But in 2004, a partnership was formed between Forest City Developers and the U.S. General Services Administration to redevelop the Navy Yard annex and bring in six-million square feet of multi use space, according to the Wall Street Journal. It was ambitious project that to-date is about 20% complete. The neighborhood saw another boost in 2008 with the opening of Nationals Park, but as the recession deepened, development plans stalled. It would be several years before projects were picked up again and completed, but since then, construction has been near constant. The Wall Street Journal reported that since 2012, over 2,300 new residential units have opened in the area and there are an additional 3,700+ in the pipeline. And these luxury apartments are fetching premium prices. The average studio/one-bedroom in Navy Yard/Capitol South was $2,173 per month, which is higher than the city average, but still about $400 less per month than average units in more popular neighborhoods like Logan Circle, Foggy Bottom and Shaw. For the price, tenants get a bit more square footage and a myriad of high-end amenities like rooftop pools, doormen and boutique gyms. Developers are counting on demand for luxury units keeping pace with construction efforts and so far it seems the growth rate is manageable. But there is still more to come; construction of the new soccer stadium is slated to start soon and phase one of the mega-project, The Wharf, undertaken by Hoffman-Madison, is expected to open in late 2017. This $2 billion dollar undertaking is one of the largest development projects on the East Coast. When it’s complete, 24 acres will be developed into three million square feet of retail, office, residential and hotel space. Additionally, New York powerhouse Related Cos. has partnered with Ruben Cos. on the 383-unit One Hill South, which is set to open early in 2017. 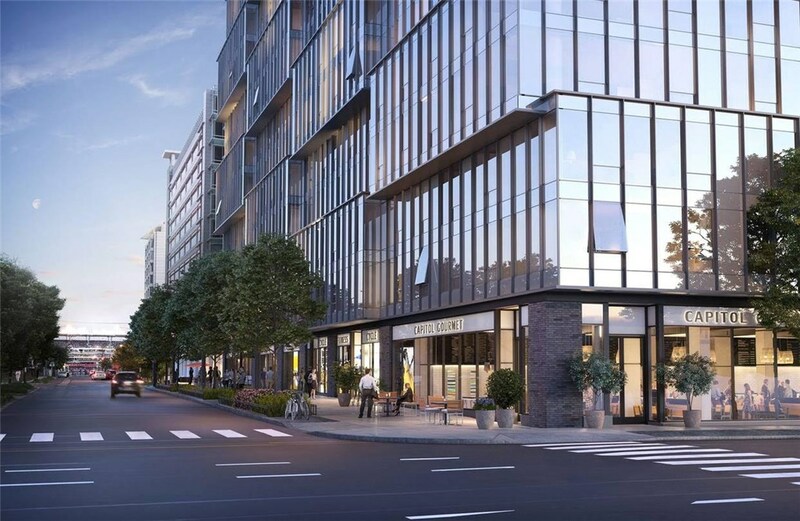 This multi use project – Related’s first effort in the DC market - will boast 25,000 square feet of retail space, an Equinox gym and a rooftop pool according to Curbed DC. Development firms are hoping that by offering luxury lifestyles and capitalizing on the buzz surrounding the neighborhood and all of its new real estate, they will be able to fill units with ease.